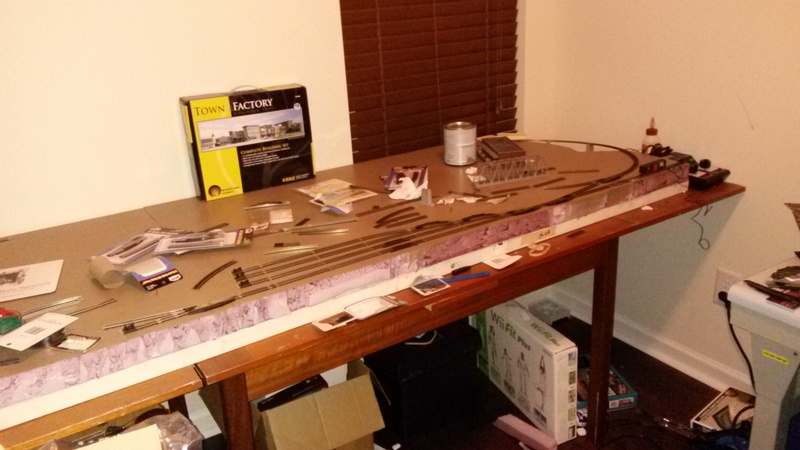 I'm back once again building my n-scale track on a door. After struggling with spaghetti bowls (which was pointed out by many people here) i've come up with a much simpler plan. 80" x 30" Hollow core door with 2" foam cover. This is downtown "Piney Plains" a fictional city in North Carolina serviced by the Norfolk Southern, with interchange with the ACL/SAL (and SCL) Southern, with occassional Amtrak service. My engines to be used will be a Kato RSC-2 re-shelled with an AS-16 from Shapeways, to emulate a Baldwin AS-416 (almost all of the AS-416s made were used by Norfolk Southern 17 of the 25 built), An Atlas GP-38-2 with grey NS paint, a Lifelike GP-20 that will be painted up to be a GP-18, and Fox Modern NS Heritage N/S loco (AC-44W GEVO - out of place for era, but Rule #1, and it has the right paint job ) . Will also be occasionally visited by my 40-year-old Bachmann U36B SCL #1776 Bicentenial. Occassional 'heritage steam' might show up, too. Rolling stock will be Boxcars, Closed hoppers (better to pretend its wood chips one run, corn the next, and pellets the one after that), Reefers, and tankers, with a few Intermodal cars thrown in (treated like boxcars). Passenger trains may also show up when I just want to watch 'em roll. As designed only 1 train will go on the main at a time, but the yard can be switched while another train runs. Industries are typical North Carolina industries of the era. The Interchange will have a backdrop industry of a Textile Mill/Clothing Manufacturer. Also present: Tobacco, the #1 industry in the era, Furniture, Chemicals, a Grain Elevator + mill, a pier, and a processed food factory. all industries can take almost any type of car. 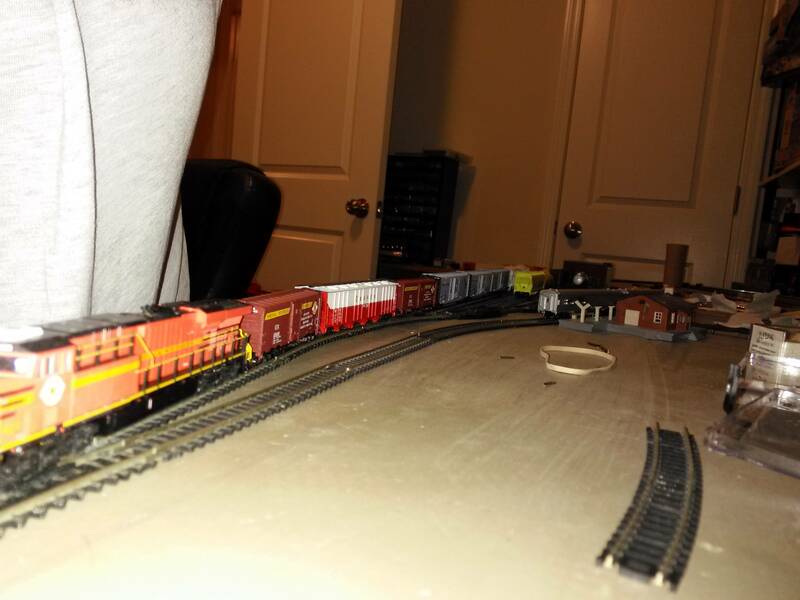 My plan for this is to use the Supernook yard (currently 8-5-5, but eventuallly 9-5-5 capacity) to build a 9 car train from 14 cars in the yard (using 1 suit of cards + joker), plus caboose. where each car goes will be determined by a six-sided die or a 4 sided die for Reefers. When I hear the iron horse make the hills echo with his snort like thunder, shaking the earth with his feet, and breathing fire and smoke from his nostrils, it seems as if the earth had got a race now worthy to inhabit it. This looks like a buildible and fun to operate project. Instead of using a door covered in foam, you could use a grid of i"x4" covered with a piece of plywood and then foam. This would enable you to go a few inches longer, and a few inches wider is so desired. It might also make the base cheaper. There may of course be good reasons to not go larger. thanks. I actually already have the door and foam glued together, with the harbor area carved out. Even stuck the 3 11" sections that will be the curved trestle (based on the Real world Albemarle Sound Trestle) just using 3 Atlas bridge piers until i can build it. I like it. I checked for all the usual problems and don't see any. 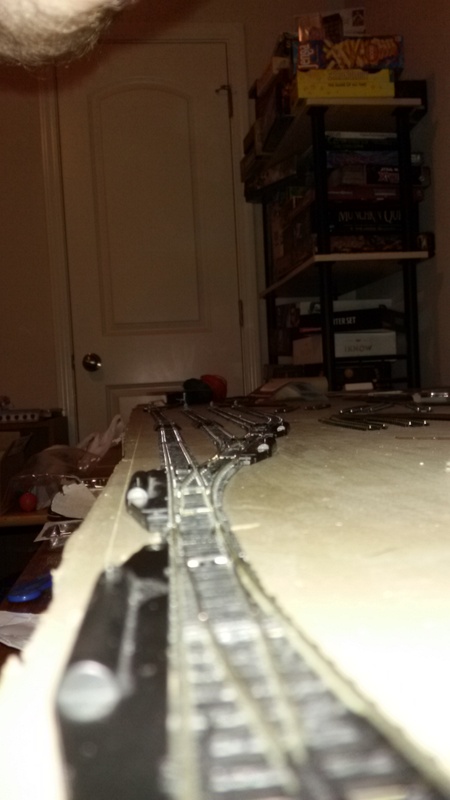 The only thing I would recommend is to move the mainline to run below the passenger station instead of above it so that it is close to the caboose track. It is more realistic to be close to the yard and it will give you a better view of the train while it is in the station. Comparing this with some of your previous plans, it looks like you've simplified enough to make the layout very practical without sacrificing the original intent. This looks like something that should be practical and fun to build and operate. 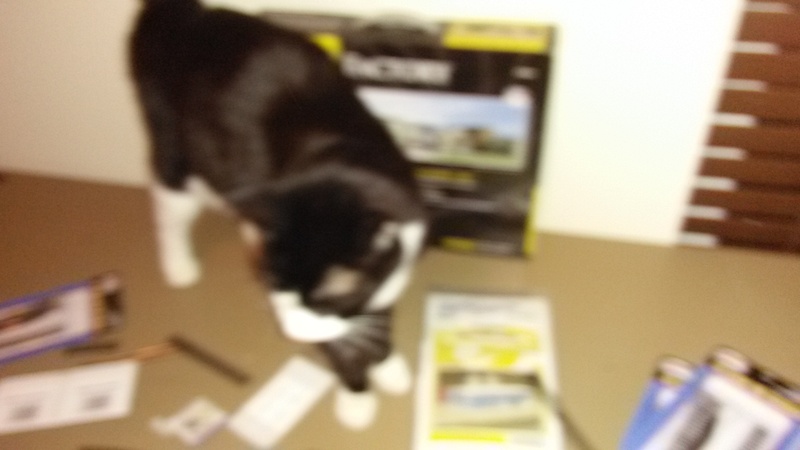 I especially like tha fact that you've chosen an interesting and somewhat unusual prototype (the old NS), and have included the industries and scenic features that are closely associated with that railroad and that part of the world. This railroad should be a lot of fun. The area between the yard and the station will be a parking lot for yard crew and passengers. 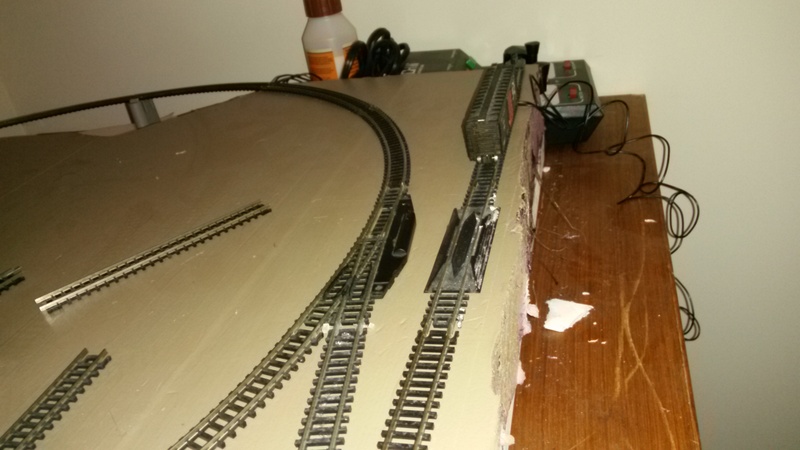 Just reviving this to say I've actually started laying track. an overall view of what I got done. Need to straighten that just a bit. haven't applied power yet. I'm curious, how much have put intot his layout $$$wise? 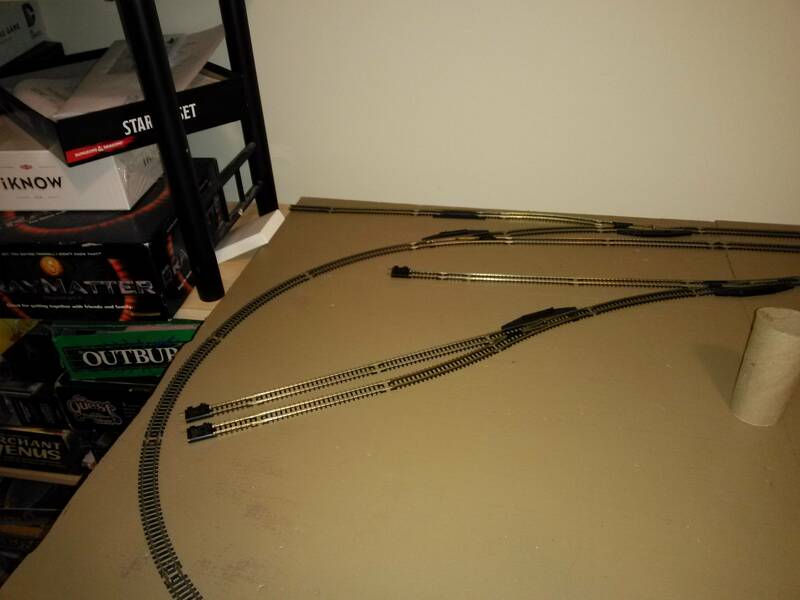 I'm looking for a small spce layout I can do while I wait to find a and move into a bigger house, so I was thinking of a doorlayout in N scale. 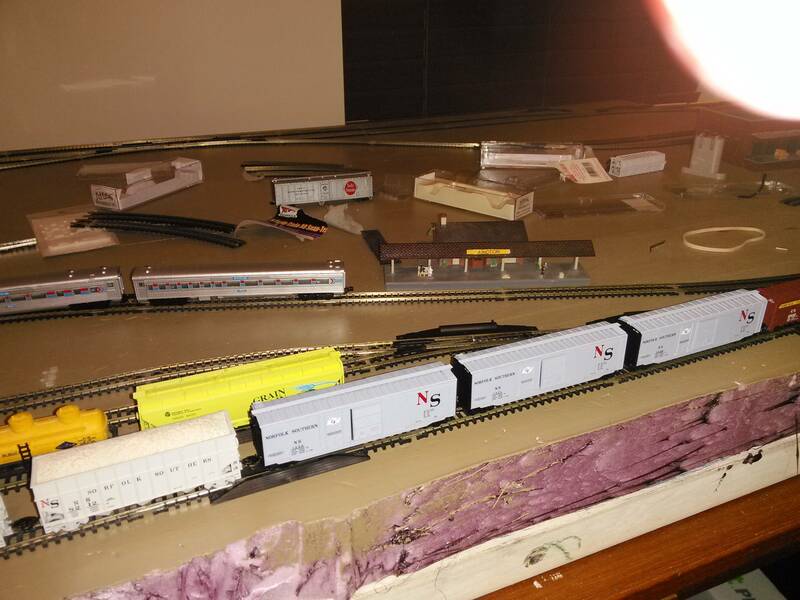 about $700 or so in track, buildings, rolling stock and locos, spread over the last year. A Door is at the upper end of 'small N-scale layouts' actually. the closest analogue to the ubiquitous HO 4x8 is a 2x4. And, to be honest, a 2x4 does NOT have the 4x8's access issues, so you can place the long end against a wall and still reach easily. In fact with a 2x4 the old HO argument that you're using just as much space with a round-the-walls as a 4x8 actually falls down, and the Island makes sense, spacewise. 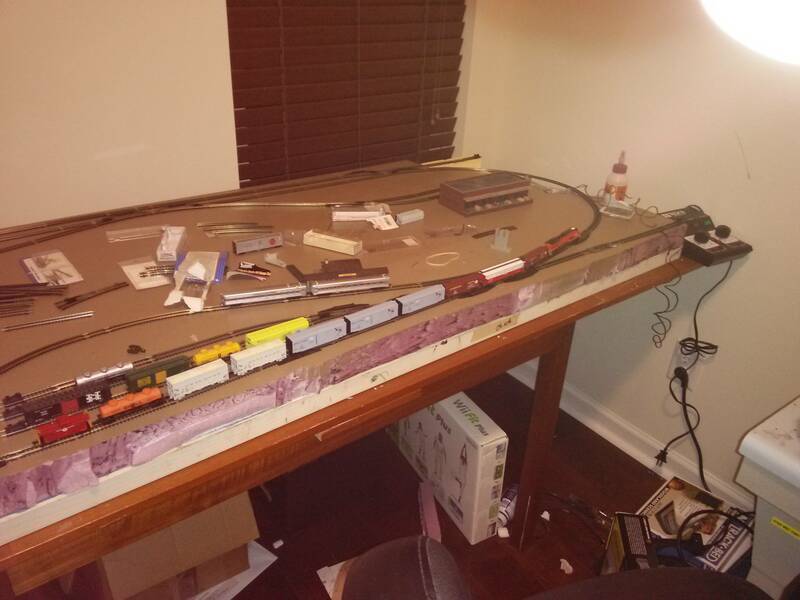 well, the track is placed!